Welcome to the North Bergen ShopRite! 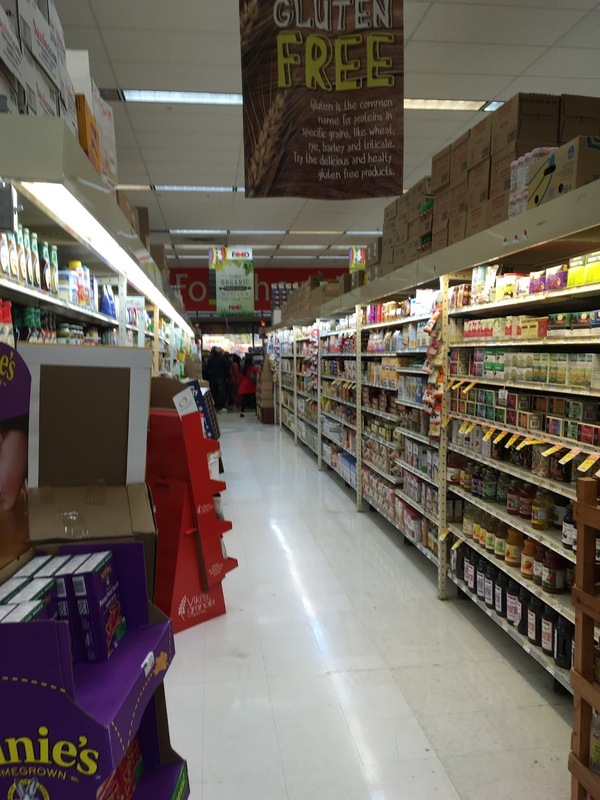 A while back we saw the brand-new Food Bazaar in North Bergen. It is located just up Kennedy Blvd, but with the traffic it's a good 10 minute drive! 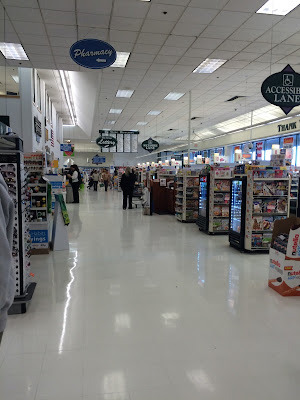 The ShopRite here in North Bergen is a pretty bland store. There's nothing really wrong with it, but it sure was a letdown after visiting the Food Bazaar for the first time. According to Styertowne, this location has been in business since the 1960s, but was renovated around 1998. It's currently owned and operated by the Inserra family, whose stores I am not a huge fan of (although that might be changing, as I visit some of their newer stores). This particular store does not look to have been renovated since that 1998 remodel, and it's beginning to show its age. 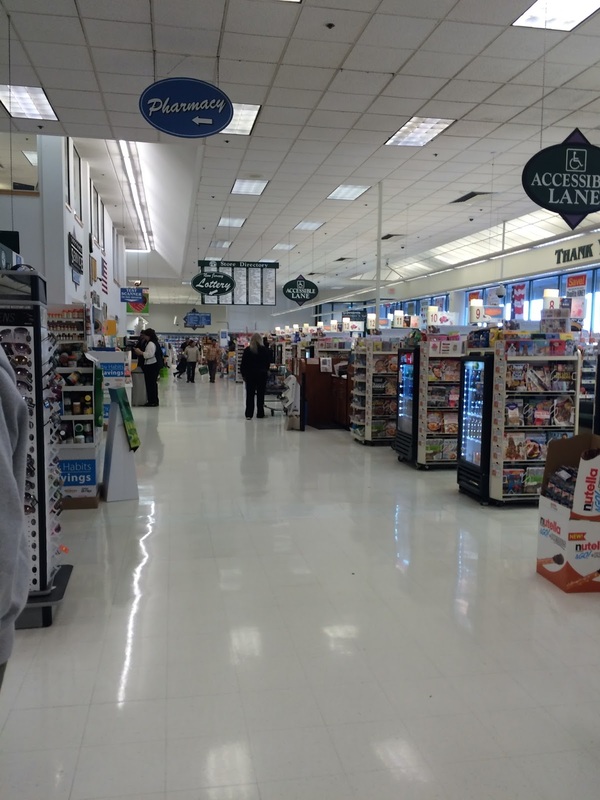 As with many Inserras, there is an entrance/exit combo on either side of the store. The left side will bring you first to bakery/hot food, the right side will bring you to dairy/frozen. Above: The bakery department immediately inside the left-side entrance. 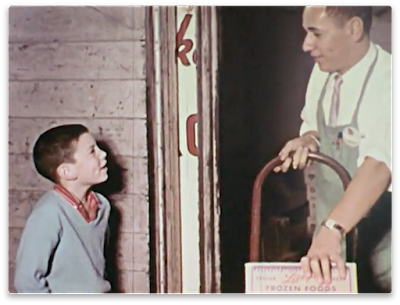 Looks like some bakery service (maybe fresh bread?) used to be here and has closed, with displays in front of the counter. Maybe it was just a bad day or a bad time, but the bakery department was almost empty in many places. Past bakery is the hot food/food court area, which is pictured here looking towards the front of the store. While Food Bazaar has a small hot food counter, there is no in-store seating. Produce is in the back corner behind bakery/hot food. 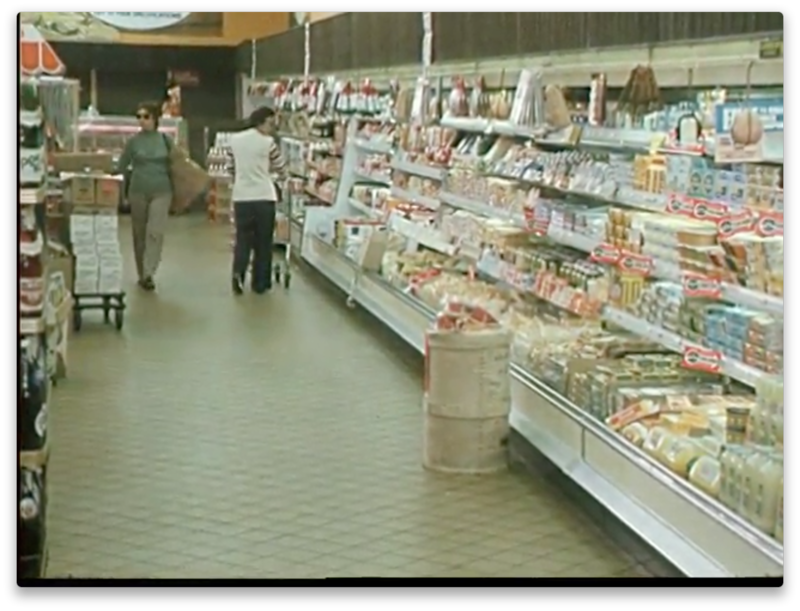 In the above photo, we're looking towards the back of the store, where deli/seafood are located in an alcove. Both produce and deli/seafood are located underneath these cool lit ceilings. They would be significantly cooler if all the lights actually worked. 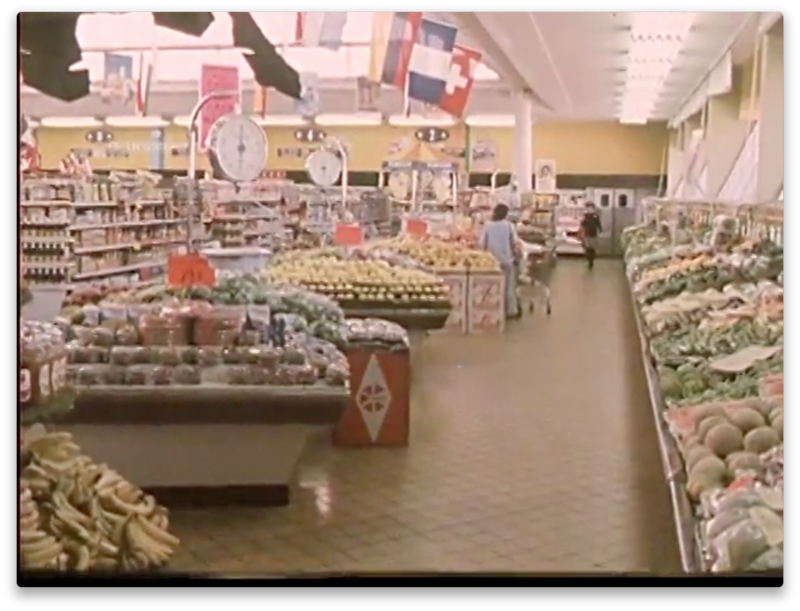 Let's take a look in some of the grocery aisles, where the customer service and pharmacy counters are located in islands along the front-end, but in the grocery aisles. And of course, I have to take out a little bit of time to make fun of this store's organization. 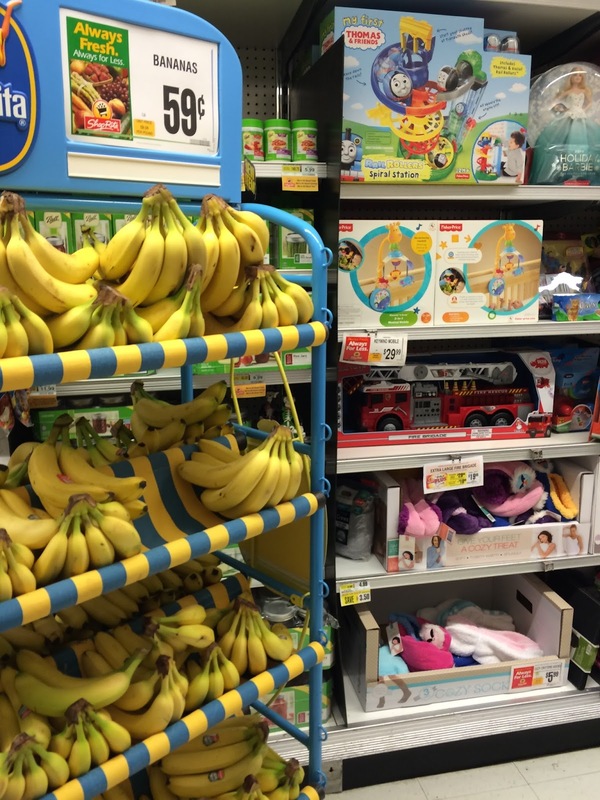 This is a display in the first or second aisle! The islands including pharmacy and customer service are to my right here; the checkouts are past them to the right. The grocery aisles are to the left. Dairy is in the far back right corner. Again, maybe it was an off-time, but this store was really a mess in a lot of the departments. A ShopRite shouldn't have this mess, no matter who owns it or what time of day it is. Frozen foods are in an alcove along the front wall and continue along the last aisle. Looking from frozen along the front-end, with checkouts to the left ahead. Above: the front-end, with checkouts to the right and customer service and pharmacy to the left. These baskets caught my eye on the way out. I really doubt they're referring to ACME Super Saver of the 1970s, since (1) they didn't look that old and (2) the color scheme is all wrong. 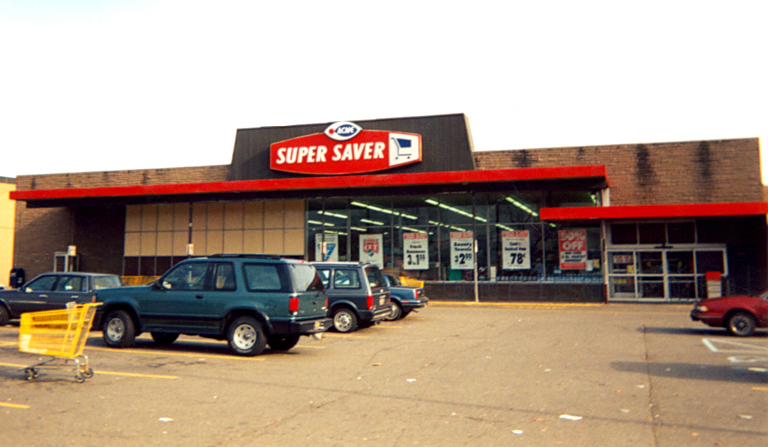 However, I really have no idea what Super Saver they might be from! One more look before we head out of North Bergen! So I don't really know what to say about this ShopRite. If you've been to pretty much any other Inserra store, it's virtually identical. It was a little bit of a mess, but maybe I was there on a bad day. But the prices were great, of course, and it was fairly clean. I don't know that it's worth a trip for itself. 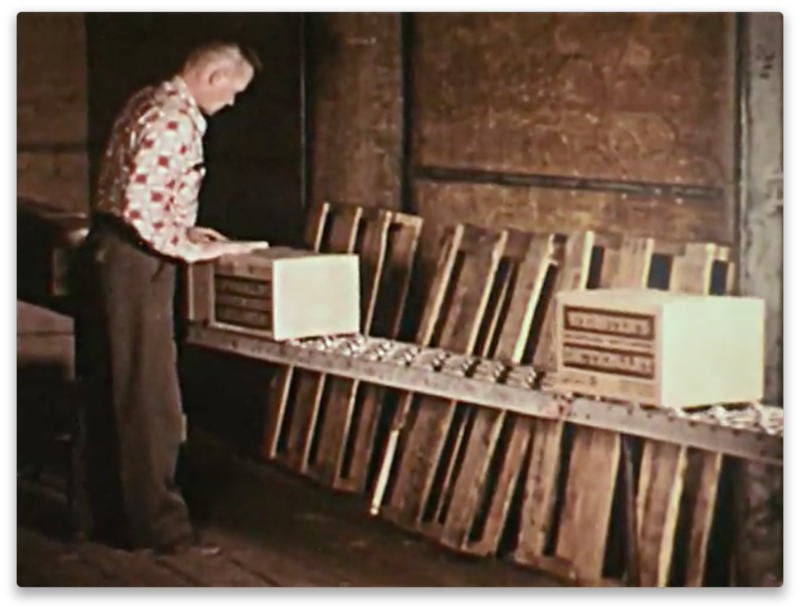 Check out this 1960s film from Archive.org! 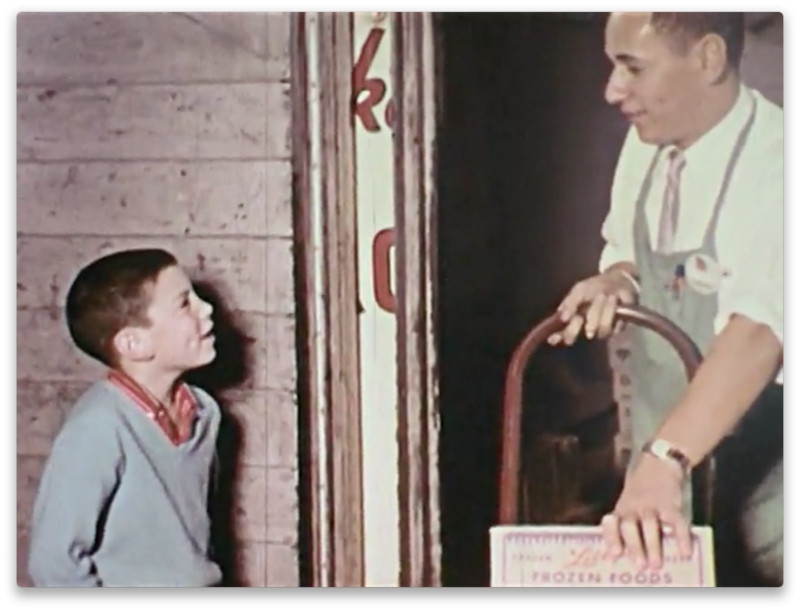 It gives you a tour around a Mayfair supermarket (no relation to Mayfair around here as far as I know) told from the perspective of a manager showing around his son (whose name, of course, is Johnny). In case you couldn't tell, I'm a big fan of Food Bazaar. And so when I was driving through Bridgeport, CT, I had to stop at this store. At 61,000 square feet, it's one of their biggest. 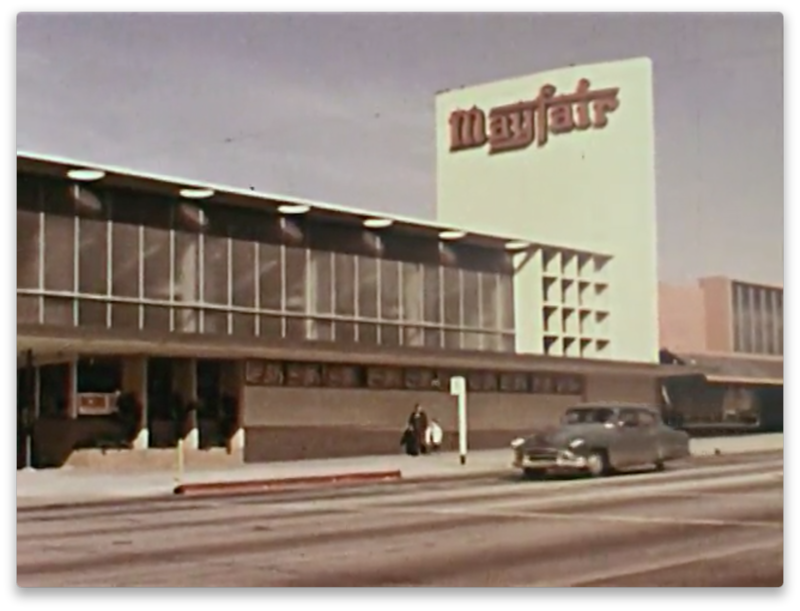 It was built as a Shaw's in 1997 but was a failure and closed soon after. In 2007, Bogopa (the parent company of Food Bazaar) announced they were taking over the location. The new store opened in 2010. Above: Shaw's, date unknown. From YP.com. From what I could see on my visit, this Food Bazaar is a huge success! The parking lot was jammed and the store was very busy. Almost every register was open. 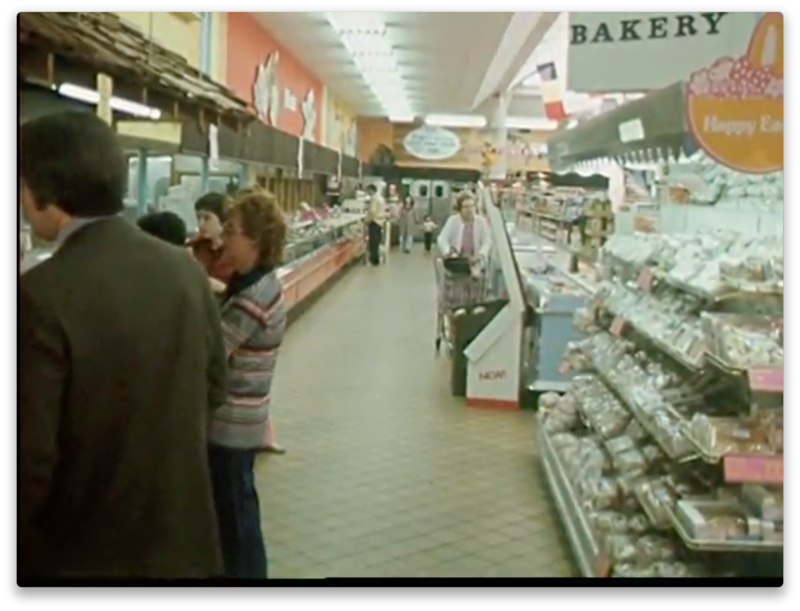 I don't know what Shaw's layout would have been, but in Food Bazaar, you enter on the far right (under the glass section). The bakery is to your right, and produce is straight ahead. 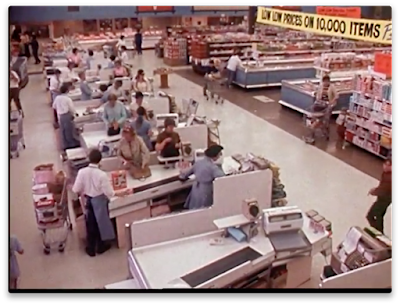 Along the right-side wall is the deli/prepared foods section, including a few tables to sit and eat in-store, with seafood in the back right corner. The entrance is to the left in the above picture (which was actually supposed to show the baked goods on the shelf!). We're looking from the front of the store (bakery) towards the back. 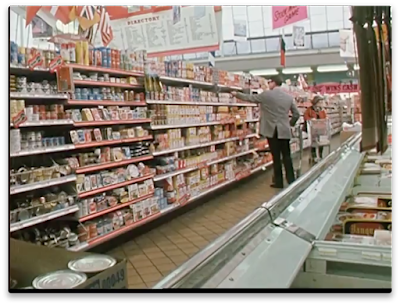 The deli is where the drop ceiling comes out farther, next to the "hot food" sign; the seafood department is where the blue wall starts. For an ethnic store, Food Bazaar runs some of the best bakery departments in the area. This is immediately when you walk in to your right. Food Bazaar's produce departments are generally pretty great also. 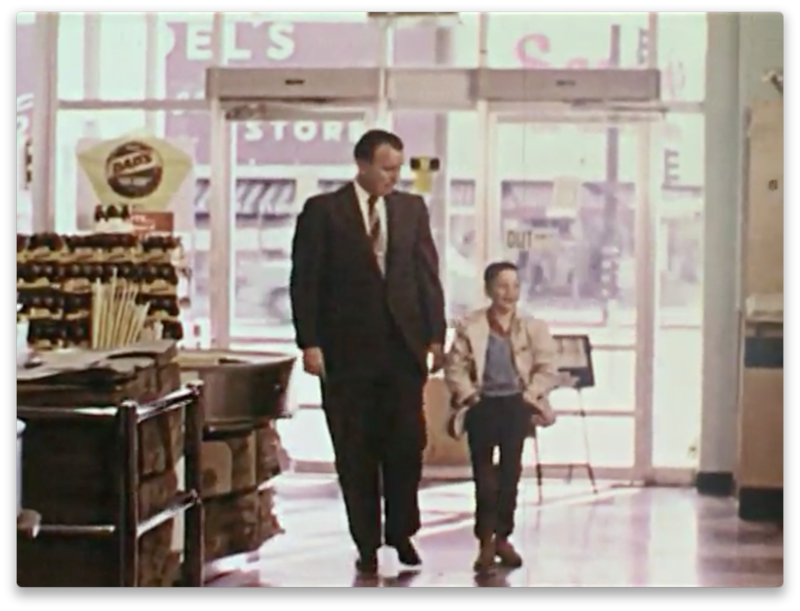 This is as good a time as any to mention my one biggest complaint about this store: the floor. It's a patchwork of at least a dozen different colors and textures around the store. And it's kind of old, so it's in pretty bad condition. Why not just scrape up the whole thing and leave it polished concrete? The small café (clearly an afterthought, although the store does have hot food, sandwiches, and salad bar). The deli is in the back right corner, with seafood to the left. The salad and hot food bars are not open on the weekends. 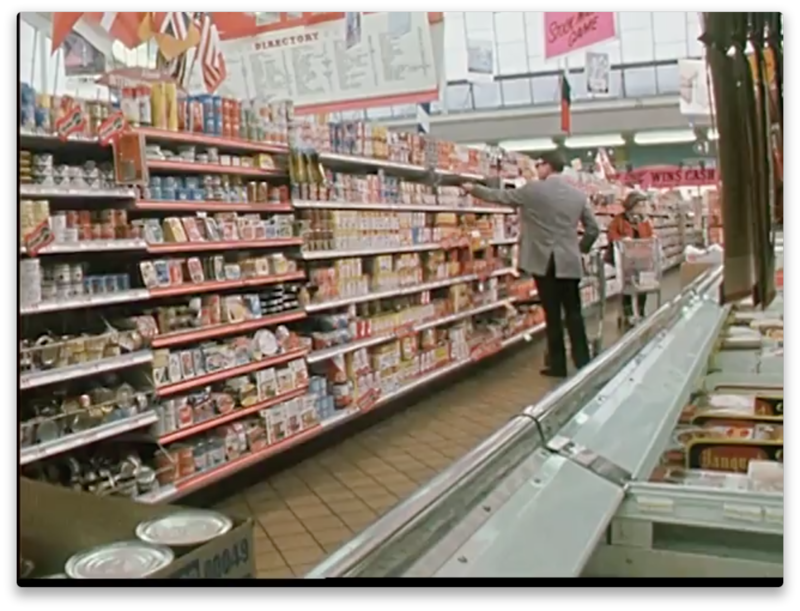 The seafood department consists of a service case running along the outside wall of the store, and an island where the "lobster" sign is. It's really huge. Continuing along the back of the store, we see the meat department service counter. 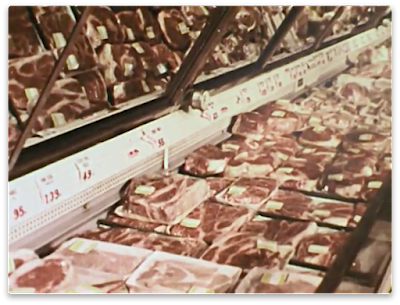 The packaged meat is actually in one of the aisles, and dairy is actually along the back wall where meat usually is. As always, there is a huge international section, including the famous display in the first aisle. 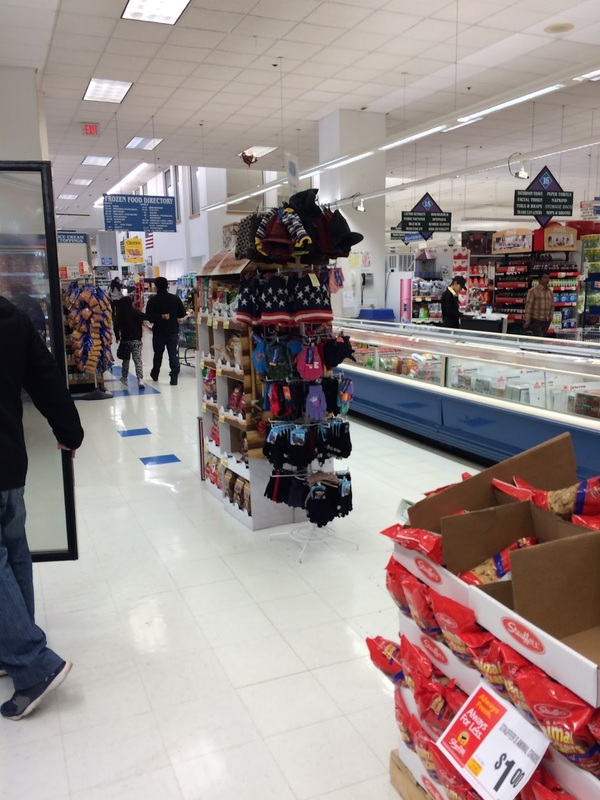 But this store's huge size allows for both sides of the first aisle to be stacks of packaged goods! 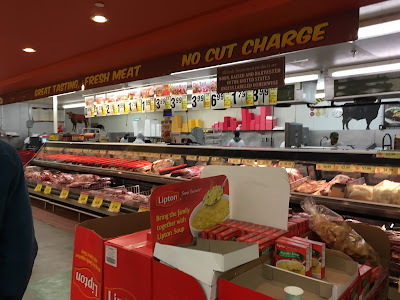 The above sign is over the packaged meat cases in the first or second grocery aisle. It's a great sign but I have to wonder, why here? By this point, you're not welcoming anyone, they've already come in! Above, the gluten-free section in one of the grocery aisles. Dairy is along the back wall of the store. Tell me, WHY do you have to stack toilet paper on top of your dairy cases at all, but if you do have to, do you have to put it in front of your dairy sign? One of the freezer aisles toward the end of the store. The last aisle is soda, snacks, and candy, which is a little strange. 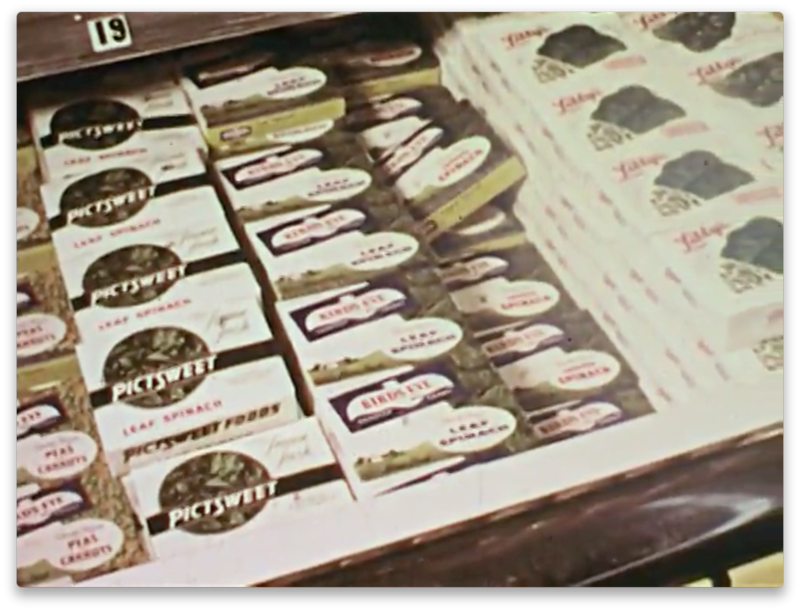 You almost always see dairy or frozen foods here. These wall graphics make me wonder if this was ever non-food (like party supplies, paper products, etc. ), but they also don't strike me as the type of decor Shaw's would put up. 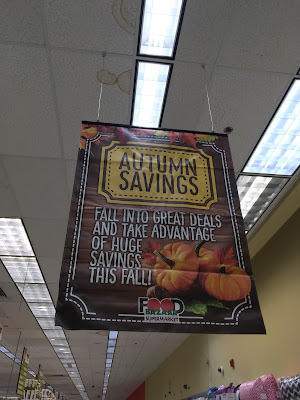 I was at the store soon before Thanksgiving last year. The natural/organic section in one aisle. Before we head out, here's a look down the front end. 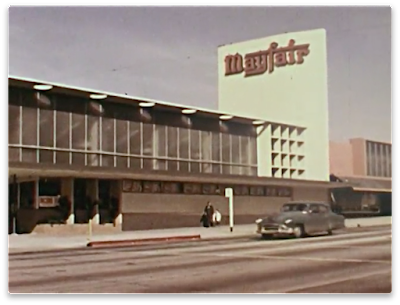 The area to the right here with the shelving seems like it was built as a service department by Shaw's (maybe a pharmacy or bank branch?) 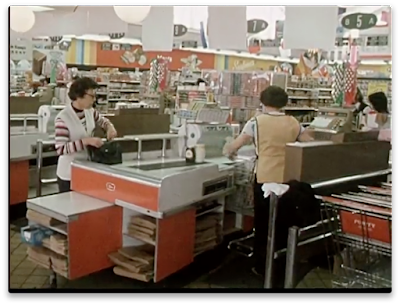 The checkouts are past it to the right. Unfortunately, I was taking pictures into the sun here, so they didn't come out so great. 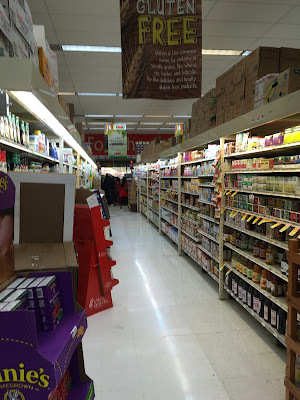 The Bridgeport Food Bazaar is nice but not really nice like their newer stores. 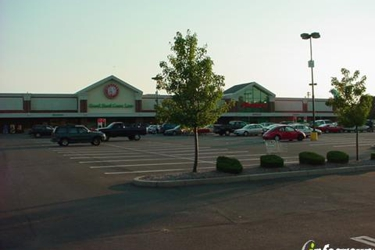 Mostly it's big, and is a major option other than Stop & Shop and Price Rite for the very diverse city of Bridgeport. And it must have been a success as Bogopa recently took over the former Food World IGA and opened its first Farmers Market by Food Bazaar, focusing on the fresh departments.